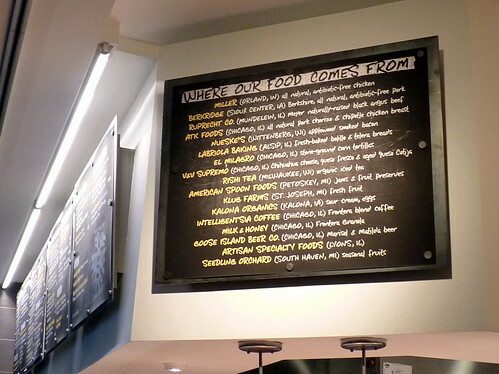 Lilya wrote: Sea-Tac (SEA) has a good variety of places to eat, though most are your typical American options. Sea-Tac has some good dining options, especially beyond the standard chain fare of your generic airport. If you can't make it out to the Waterfront in Seattle, the Ivar's in the airport serves fish and chips that are just as good (albeit in less interesting surroundings). I especially recommend it if you've been to Seattle before or are flying through in the winter; otherwise you should go get them in person. Bumping this to recommend Ivar's in Sea-Tac. A very pleasant place to eat seafood and wait for a delayed flight. Beats the crap out of Legal in Boston Logan (similar in that it's a sit down seafooder in a seafood town's airport) which was at one time a good option but has snowballed downhill to the point that the last and final meal I had there recently was completely vile. I have used O'Hare airport three times in the past ten years as I prefer to use Midway, Milwaukee General Mitchell or Rockford Airport when I travel. On my last trip, I went to the McDonald's and it took no less that SIX times for the cashier to give me the right change from a $10 bill. This last trip, I decided to get one of their featured items - the oatmeal. The response - "we will serve it to you but we have no raisins." Then I ordered a fruit and yogurt parfait and got a "we are out of those". All on a Monday morning at 7am. You would think that a goldmine like that would have their stuff together. In the Cleveland Airport, one will find the Pub, an outlet of a local pub chain, in the "wheel" between the spokes to each concourse. I had a really excellent beer battered cod there one night. The accompanying chips weren't so hot. Over other layovers, i have enjoyed the real scotch egg along with a very braod selection of beers. I go through Cleveland 3 or 4 times a year Montréal <—> KC, and it's good to know about this place. In Miami we had a layover, so we took our bags and went to the Versailles restaurant via taxi. We took a taxi back. It worked fine, no need to rent a car. I think Versailles has an outpost inside the airport as well. We took leek's advice and hopped in a cab. It was a nice day for a stroll down Lincoln Road. Lunch was had at AltaMare. We shared an appetizer that was definately one of the best things I've eaten in a while - Grilled Octopus with Warm Farro, Chorizo, Grilled Lemon, Green Tomato, and Saffon Aoli. The octopus was smokey and tender, the farro al dente with tiny crispy bits of chorizo - just perfectly done. We opted for sandwiches as entrees - a grilled local (can't recall the name,) fish sandwich for me and a grilled chicken foccacia for Jonathan. Both came with side salads. The greens were a nice assortment and very fresh, but I felt they were a tad overdressed. We enjoyed a couple of glasses of Albarino with lunch and well-made post-lunch cappuccinos. Service was aloof despite the fact that there were only a few tables occupied, the Chef and owner were present, and I did make attempts to engage our server. Maybe it was the obvious carry-on luggage that tagged us as one-time diners, however, I suspect it's just their style. It certainly was not poor service - just a little cold. Noticed at the last minute that a gratuity was added to our table of two. In Milwaukee you can go to Bartolotta's Northpoint Custard at the airport. Great burgers and sides. Its in the concourse so anyone can go too! Dang, eatwisconsin, why wasn't Bartolotta's there when I went through Billy Mitchell a dozen times a year???! Visited Tortas Frontera at O'Hare Airport, Terminal 1 and had the Pepito Torta (Beer Braised Beef Short Ribs) and Chips with Salsa. Total cost, $15.00 with an airport employee discount. The torta was a really good sandwich with a nice kick to it. The chips were decent but they skimped on the salsa (two little containers of a salsa verde and salsa roja). Nice change of pace from the usual airport food but not an everyday thing for me. Last edited by Jim_Shorts on February 25th, 2011, 2:25 pm, edited 1 time in total. * LaGuardia Concourse D should have been better, but the Five Guys served fries that while dark-cooked were oily and limp (no Gold Peak Iced Tea and no ketchup pump for the fries, the place loses a lot of luster). Todd English's Figs Cafe looked like nothing special whatsoever, slightly glad I ate before going through security. Slightly better: Washington National's American/United concourse has both a Potbelly and a Fuddruckers. Not too shabby burger and a good shake can be had. Cleveland has an Obrycki's in the Continental terminal. No time to go to The Pub, so had excellent crab cake there last Saturday. Very pricey but worth it. The fish 'n chips looked high quality, too. I'll go again. Newark Liberty (EWR) Terminal A, long a food desert, in in process of upgrading since the last time I was there over a year ago. Remodeling continues -- the American and United concourses have lots of walls indicating new stands and restaurants. Cheeburger Cheeburger Express replaces the limited Burger King, a big notch up, with skin-on fries, a wide variety of shakes and bigger burgers (although mine was dreadfully overcooked, it's still a big notch over the King). I'd last seen a Cheeburger in The Glen, they don't have any IL locations currrently. At CDG (Paris) terminal 2E, I had a great lunch at Bar Exki, which is near about Gate 40 (if you're coming through security, to the right and behind you, but not a far walk from gates in the 50s and 60s). It's described as a bar & as a healthy food option. I'm not sure it's either, but it's delicious. We had a quiche (spinach, tomato & bacon, I think) and a lentil-crayfish-potato curry salad, plus a piece of flourless chocolate cake and a passion fruit-raspberry tart, wine & water for about 40 euro. At JFK (New York) in the international terminal, we had good shawarmas from a Turkish place. Walking toward the end of the concourse at Terminal 1, it will be about 3/4 of the way down on the right hand side. I had the Cubana at Tortas Frontera at O'Hare Terminal 1 on Sunday, and it was extremely delicious. I haven't eaten enough Cubanas to know if it was authentic -- I suspect not, with Nueske bacon instead of ham, and avocado slices. But it sure was excellent. Perfect proportions -- not too much cheese (possibly too little for some tastes, but perfect for me), the bacon, although yummy, did not outweigh the pork, of which there was just enough, but not an excess; the avocado was a great addition, and the mustard had a real bite to it. It was right on the edge of totally over the top, and yet not falling down the other side into excess. (It was served with some good smoky salsa for dipping, but why?? Totally unnecessary, and I am a salsa addict.) It was $11, which seemed a little steep in the abstract, but I will most certainly be back for more. The service must have been improved since they opened (previous complaint upthread). It took maybe five or six minutes, which is slow for airport food, but not slow for quality, and everyone seemed to be working efficiently. Honestly, it was good enough, I would buy one on my way home through O'Hare to eat in the cab or at my house. YourPalWill wrote: I have flown United to and from Las vegas several times in the last few months. Right before one reaches the rotunda that houses the United Gates, beyond security, there is a David Burke takeout that features among other things pretty good burgers, excellent fries with asiago and truffle oil (just like Primehouse), some pretty good soups, and Burke's signature cheesecake lollipops. A great option compared to most in that airport. Just steer clear of the kobe beef hot dog. It was massive, but I'd prefer a good Vienna beef. It was very finely ground, not anything special and actually rather bland in terms of flavor and was topped with horribly greasy onions, boring relish and mustard. But I'm curious to try some of the other offerings so I'll give it another shot. After having the hockey puck sliders a couple of weeks ago at Burke in the Box, I've decided two visits are enough. Unseasoned, overly packed, overcooked and too much of the English muffin-type bun . . . really awful stuff. I have to agree, BR. On my last trip to Vegas, I stopped by Burke's for a quick bite and was competely disappointed. What I had experienced a couple of years ago no longer exists. I guess that's hat happes when the consulting chefs leave and the minimum wage staff takes over the kitchen. Judy H wrote: I had the Cubana at Tortas Frontera at O'Hare Terminal 1 on Sunday, and it was extremely delicious. I've been stuck at O'Hare a few times this summer and agree. Odd as it sounds, I think this is one of Bayless's best efforts because it is so much better than what one expects or gets even from the top airport restaurants. I had a nicely done Bohemia michelada with good guac and chips and a chile con queso mollete the other afternoon, and it was all great irrespective of venue. My fellow delayed passengers from TX and NY were freaking out. The "secret" seems to be that the O'Hare location is run by real restaurant staff (not sullen airport workers), including a lady in chef gear expediting who clearly knows how to run a kitchen. I've been undewhelmed my last few visits to Topolo, which I think time has passed by, but Xoco and the airport place give me renewed respect for R.B. He's perhaps better at fast food than fine dining, and he's clearly no slouch at the latter. This is something that's often tried but rarely done so well. The obvious other example is Wolfgang Puck. I'll take Bayless, though. Ate at Ivar's in Sea-Tac last month and really liked it. Some good options in Seattle's airport. Impressed. I first ate at Ivar's Pier 54 in 1957. Took my first date (8th grade) there. Ate there again three years ago. Still decent. Not great, but pretty damn decent. Glad to hear that they're holding the line at Sea-Tac. I was at SFO the other day and grabbed a bite at Yankee Pier. I have to say, I came away pretty impressed. Clam chowder, 3 oysters, 3 shrimp, and a dungeness crab cocktail were all very solid. Not as good as my usual SF lunch at Hog Island Oyster, but certainly good (even very good) by airport food standards. Terminal 3, SFO (gates c 65-90), Fung Lum: a *really* nice bowl of Hong Kong wonton soup. Nice well-seasoned broth, big hank of thin egg noodles, and c. a dozen good-sized, hand-made very tasty, very tender shrimp+pork won tons. $10. I'd do it again in a heartbeat. Enjoyed a terrific brat at the Munich airport (international terminal) while connecting from Athens. Pretzel was fine, but nothing you can't find here, but brat was great - juicy, nice snap and really flavorful. Seems to me sort of a "world's tallest dwarf" kind of award... and it's a shame the airports I get stuck in all the time don't have food as good as ours: Newark, Philly and San Diego. Actually a very accurate list, consistent with this thread. They have Tortas Frontera at #1, which is probably right. JeffB wrote: Actually a very accurate list, consistent with this thread. They have Tortas Frontera at #1, which is probably right. Certainly made my day when I found it right by my gate Friday. Terrific breakfast torta with eggs & rajas and a mango lime aqua fresca that almost brought tears to my eyes. Grubstreet quoted JeffB today, and since for whatever reason I can't post a comment there, I will here...The lady in chef gear fooled you, Jeff. She and everyone else at Tortas Frontera is an HMS Host employee. They're mostly efficient and a couple do seem to know how to run a kitchen, but they're not Bayless's people, they know nothing about Mexican food, and they can't for the life of them shake a margarita. Thankfully, the delicious food is based on very simple recipes and very good store-bought bread.